A close-up of the bust of George III. 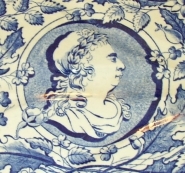 An earthenware well and tree platter printed in the Farmer George pattern. The center bust is of George III in Roman-like attire. The bust is surrounded by the Union flowers: the rose, thistle and shamrock. The outer section of the pattern is made up of cornucopias of fruits, flowers, crops and grapes. Between the cornucopias are four panels of different farming implements that include a fork, spade, watering can, rake, plough and sickle. The pattern may have been produced in 1810 to celebrate George's Golden Jubilee or possibly in 1815 to commemorate the victory at Waterloo and the peace of Europe.